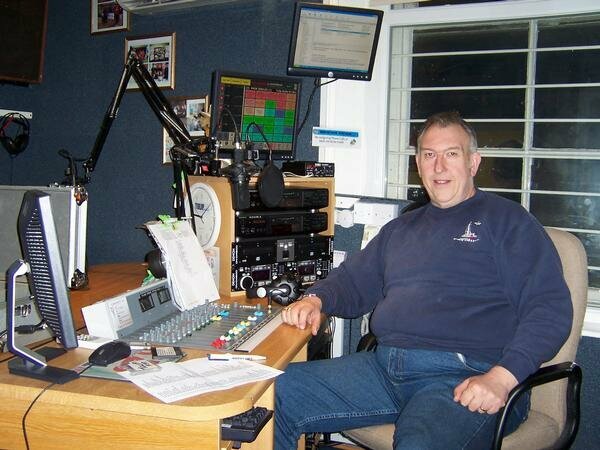 Good Rockin' Tonight is the weekly Rock'n'Roll program on the legendary Radio Caroline. It's on the air every Tuesday from 6pm - 9pm and hosted by Dell Richardson. (UK time) on the Internet around the World (and beyond!). Nidge with Dell Richardson in the studio for the Cliff and the Drifters Special 2 on Dell Richardson's Good Rockin' Tonight Show Tuesday 10th May 2011. 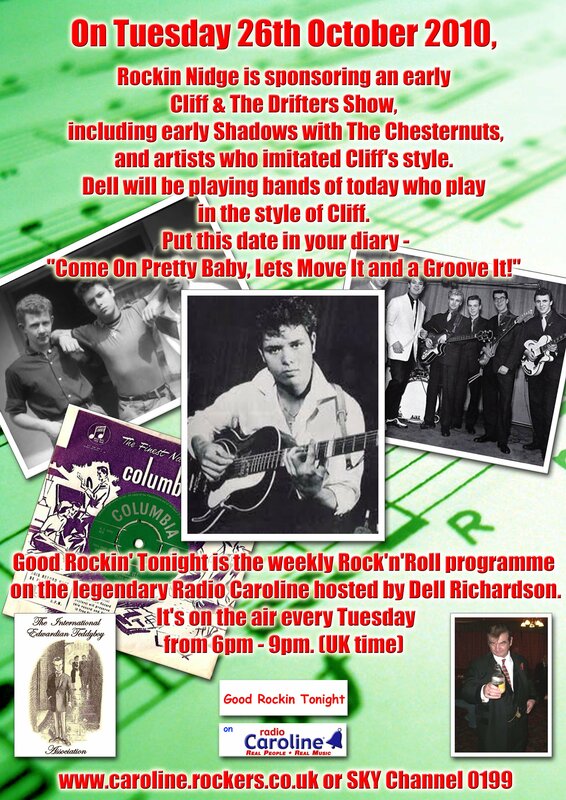 On Tuesday 10th May 2011 Nidge sponsored 3 hours of the second part of the Cliff Richard & the Drifters Special in which Nidge featured some more Cliff & the Drifters classics and rarities with Dell interplaying with some cracking British Rock 'n'Roll. Nidge with the Cliff Sing's LP in Dell's Studio aboard ship at the end of the Cliff and the Drifters Special on Radio Caroline Tuesday 26th October 2010. On Tuesday 26th October 2010 Nidge presented a CLIFF show! In other words early Cliff & The Drifters, early Shadows with The Chesternuts, and also bands who imitated Cliff's style like Johnny Worth, Les Carle and others. Dell played the bands of today who play in the style of Cliff. 'Nidge' also sponsored the night and gave away an original 'Cliff Sings' original Columbia Green LP as a prize for the GRT Competition. 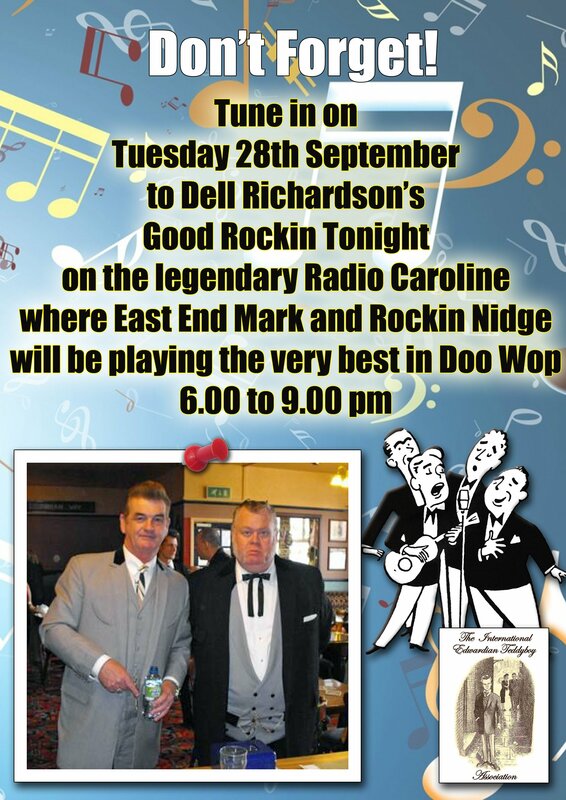 On Tueday 28th September 2010, Good Rockin' Tonight members, East End Mark and Nidge presented a 'Doo Wop' Special. They played both classic and obscure Doo Wop records from the 1950's early 1960's era, whilst Dell played the bands of today who play in the Doo Wop Style. East End Mark and Nidge sponsored the show. 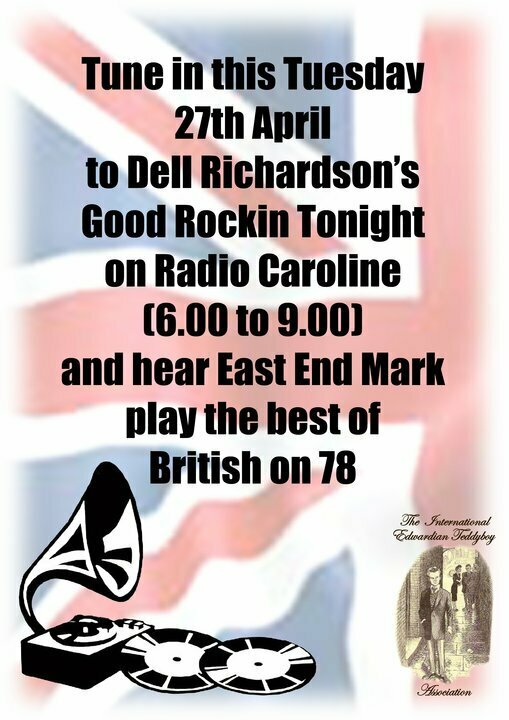 On Tuesday 27th April 2010 'East End Mark' presented a cracking 3 hours of British 78's which included Big Band and early Rock n Roll with the genuine 78 rpm shellac crackle! Mark sponsored the show and was accompanied by Nidge.